This magnificent hotel is found standing amongst a variety of shops, restaurants and bars, and next to a main road, the Hotel Nereo boasts a friendly and inviting atmosphere. The Nereo Hotel holds the diploma awarded by the ISO 9002 for international standards and has also received a further award from the Valencian regional government for its health and safety standards. "Entertainment Could Do With Refreshing"
We travelled to the hotel Nero on a package deal with Portland Holidays in the Summer of 2006. The Hotel Nereo is one of the best hotels we have stayed in considering it's only rated as a 3 star hotel!. The choice of food was excellent and plentiful, wine list was very reasonably priced and the staff were first class. Entertainment was typical of a Spanish hotel but there is so much on offer nearby. The location of the Nero is flat and there are lots of shops, restaurants, pubs within a short walking distance so you don't need to leave Rincon de Roix area. 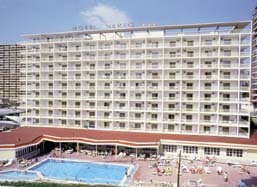 Benidorm Palace is within walking distance too, buses stop outside Nereo and the beach is very nearby. We have been to this hotel on three occasions but I do feel that the entertainment could do with refreshing a little.